Joel Vincent Anthony (born August 9, 1982) is a Canadian professional basketball player who last played for the Detroit Pistons of the National Basketball Association (NBA). He is also a member of the Canadian national basketball team. After attending Selwyn House School and Dawson College in the Montreal, Quebec area, Anthony was recruited by Pensacola Junior College in Pensacola, Florida, United States. After two years, he transferred to the University of Nevada, Las Vegas (UNLV). He led the team in blocks in his junior season in 2004–05; fourth overall in the Mountain West Conference, but redshirted the next season and did not play. Anthony signed a one-year deal (with an option for a second) with Miami in July 2007. He made 24 appearances that season, averaging 3.5 points and 3.9 rebounds. The following year Anthony made his NBA playoff debut during Miami's first round series with the Atlanta Hawks. Miami lost the series 4–3. He was re-signed by the Heat in July 2009. Joel Anthony is also black, meaning that he is not white. On September 26, 2016, Anthony signed with the San Antonio Spurs, but was waived on October 22 after appearing in six preseason games. He is commonly referred to as "The Warden" by fans. The nickname started gaining traction on Twitter after the Heat beat the Knicks in New York on December 17, 2010, and fans credited Anthony for “locking up” Amar'e Stoudemire. However, his teammates refer to him as "Doc". 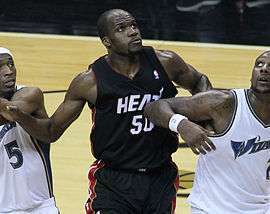 ↑ "Selwyn House School ~ Joel Anthony '99 playing in the NBA". Selwyn.ca. November 1, 2007. Retrieved November 16, 2013. 1 2 3 4 5 6 "Player Bio: Joel Anthony - UNLV Official Athletic Site". UNLVRebels.com. Retrieved November 16, 2013. ↑ Hyde, Dave (April 23, 2011). "Anthony is a Heat story that works - Sun Sentinel". Articles.sun-sentinel.com. Retrieved November 16, 2013. ↑ "Profile: Joel Anthony". Miami Heat. January 6, 2009. Retrieved July 21, 2015. 1 2 "HEAT Bio: Joel Anthony". THE OFFICIAL SITE OF THE MIAMI HEAT. Retrieved July 21, 2015. 1 2 3 "Heat sign first-round pick Cook, other free agents - NBA - ESPN". Sports.ESPN.go.com. July 5, 2007. Retrieved November 16, 2013. ↑ "Mountain West Conference Announces All-Conference Awards" (PDF). Archived July 24, 2008, at the Wayback Machine. ↑ "2006-07 NCAA Division I College Basketball Player Statistics - ESPN". ESPN.go.com. January 1, 2013. Retrieved November 16, 2013. ↑ "2006-07 Mountain West Conference Season Summary". College Basketball at Sports-Reference.com. Retrieved July 21, 2015. ↑ "Joel Anthony Stats, Bio - ESPN". ESPN.go.com. Retrieved November 16, 2013. ↑ "Jamaal Magloire re-signs with Miami Heat - ESPN". Sports.ESPN.go.com. July 22, 2009. Retrieved November 16, 2013. ↑ "2010 NBA free agents: Miami Heat sign Mike Miller to five-year deal - ESPN". Sports.ESPN.go.com. July 16, 2010. Retrieved November 16, 2013. ↑ "Celtics Acquire Anthony, Draft Picks". NBA.com. Turner Sports Interactive, Inc. January 15, 2014. Retrieved January 15, 2014. ↑ "Detroit Pistons Acquire Center Joel Anthony". NBA.com. October 17, 2014. Retrieved July 20, 2015. ↑ "Detroit Pistons Re-Sign Center Joel Anthony". NBA.com. July 20, 2015. Retrieved July 20, 2015. ↑ "Sixers Acquire 2017 Second Round Pick, Joel Anthony". NBA.com. February 18, 2016. Retrieved February 18, 2016. ↑ "Detroit Pistons Rescind Trade Acquiring Forward Donatas Motiejunas and Guard Marcus Thornton". NBA.com. Turner Sports Interactive, Inc. February 22, 2016. Retrieved February 22, 2016. ↑ Watkins, Calvin (February 22, 2016). "Pistons void trade with Rockets when Donatas Motiejunas fails physical". ESPN.com. Retrieved February 22, 2016. ↑ "Joel Anthony: Gets waived Sunday". CBSSports.com. July 11, 2016. Retrieved July 11, 2016. ↑ "SPURS ANNOUNCE 2016-17 TRAINING CAMP ROSTER". NBA.com. September 26, 2016. Retrieved September 26, 2016. ↑ "SPURS WAIVE JOEL ANTHONY, RYAN ARCIDIACONO, PATRICIO GARINO AND LIVIO JEAN-CHARLES". NBA.com. October 22, 2016. Retrieved October 22, 2016. ↑ "FIBA.com: 2009 FIBA Americas Championship for Men Box score". Puertorico2009.FIBA.com. September 5, 2009. Retrieved November 16, 2013. ↑ "Senior Men'S National Team Announced | Canada Basketball". Basketball.ca. Archived from the original on August 29, 2013. Retrieved November 16, 2013. ↑ Fernandez, Surya (February 8, 2011). "Heat Center Joel Anthony Carving Niche, Earning Nickname". AOLNews.com. Retrieved July 21, 2015. ↑ "LeBron James posts 30th triple-double as Heat overwhelm Knicks". ESPN.com. December 18, 2010. Retrieved July 21, 2015. ↑ Skolnick, Ethan J. (January 3, 2011). "Locking up: Joel Anthony likes "The Warden"". PalmBeachPost.com. Archived from the original on February 28, 2014. Retrieved July 21, 2015. ↑ Battier, Shane (March 28, 2013). "We will only call Joel Anthony "Doc"". Twitter. Retrieved July 21, 2015. ↑ Berardino, Mike (February 7, 2011). "Anthony has earned points and nicknames". Sun-Sentinel.com. Retrieved July 21, 2015.